You can make Mozzarella, Ricotta, Goat Cheeses, Paneer or Queso Blanco in one hour. No aging, no frustration, just fun and deliciousness! Make over 30 batches (more than 40 pounds of cheese) with this all-inclusive hefty kit! The Deluxe Cheese Kit includes these carefully selected and tested supplies: - Instructions with tips and variations - Unlimited Email Support as needed - 2 yards Fine Mesh, 100% Cotton Cheesecloth also known as Butter Muslin - 4 Cheese Molds (in a variety of shapes, may vary slightly from photo) - Thermometer - Metal Probe or Glass Dairy Thermometer - 5 Gluten-free, Vegetarian Rennet Tablets - Gluten-free, Non-GMO Citric Acid - Non-Iodized Flake Salt also known as Cheese Salt What you need: Simply add the milk, follow the simple illustrated steps and in one hour, you will be eating and sharing homemade, all-natural cheeses! Pasteurized store-bought or raw farm-fresh milk both work. Make sure your store-bought milk is not ultra-pasteurized or UHT, ultra-heat pasteurized. Dietary guidelines: The Deluxe Cheese Kit is gluten-free and vegetarian friendly. 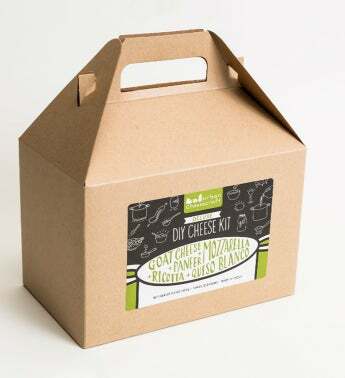 Quantity: This large Deluxe Cheese Kit makes at least 30 batches of cheese. A batch yield varies from 2 lbs of ricotta to 8 oz of goat cheese. FOOD SAFETY AND HANDLING: The kits and supplies are hand-poured, hand-folded and assembled in a food-safe, fully-licensed facilities that strictly follow the Department of Agriculture cleaning guidelines. The food items are all gluten-free but packaged in a room that may come in contact with wheat, soy, corn, nuts and other food allergens. Shelf life for the Deluxe Cheese Kit is 2 years with an additional 3 years when rennet tablets are stored in a freezer after purchase. This is cheese making re-imagined for modern lives- natural, simplified, fun and most of all, delicious!